Fiji’s Premier Eco Resort, this small and intimate getaway is bordered by the Great Astrolabe Reef. Located on the remote island of Kadavu in the South of Fiji, this eco adventure resort offers traditional thatched Fijian bures nestled in the rainforest, accommodating up to 22 guests only at one time. For divers, make sure you experience their year-round Manta Ray Dive in the Great Astrolabe Reef, one of the top dive destinations in the world! All bures are finely finished with polished mahogany timber floors, large airy louvre windows, and offer spectacular ocean views from their large private decks. Solar power provides ample lighting, and hot water is supplied by an eco-friendly Solar Hot Water system. All meals are included in the rate. Ocean View Bure – Located on the lower hillside with Queen-Size timber four poster bed. Sleeps 2. Honeymoon Bure - Top-end bures widely scattered on the hill with King-Size timber four poster bed. Sleeps 2. The Great Astrolabe Reef lies to the south of Kadavu, facing the expanse of the South Pacific Ocean. 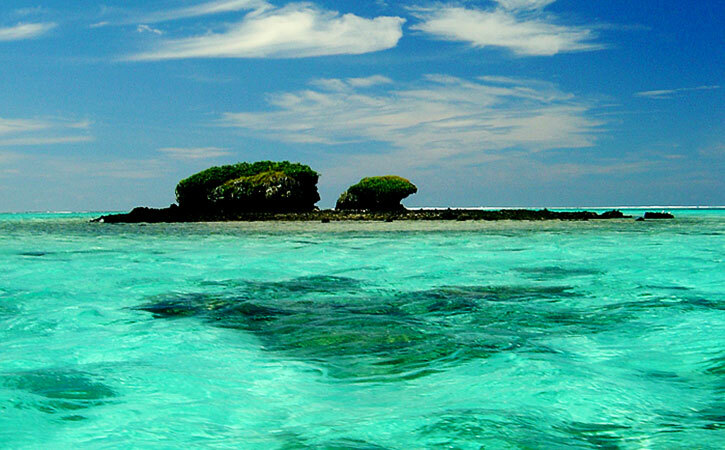 It is the world's fourth largest barrier reef and is Fiji's largest living organism. It extends along the entire southern side of Kadavu and stretches for over 120km. It is rated as one of the world's premier diving locations offering a great diversity of coral structures and marine life. Giant manta rays can also be seen regularly. Mad Fish Dive Centre @ Matava dives the entire reef system both inside and outside the reef depending on the best conditions of tides, wind, weather and waves. They cater for all levels of diver from beginner to experienced and take you to sites varying in depths, currents and visibility ranging from 20 - 50 m. You can expect a kaleidoscope of colourful corals and wonderful marine life! Home to "Spot X" and the "Japanese Gardens". This passage offers one of the finest dives in Fiji, abounding in pelagic fish including schools of sharks, wrasse and barracuda, and coral gardens exploding with colour. The passage is a marine reserve. This passage includes "Eagle Rock" and "Cabbage Patch". And is known for it's lively currents and pelagic (BIG FISH!) life. "Eagle Rock" is named after a school of eagle rays, which fly around the bommie at the mouth of this passage. The dive also typically hosts reef sharks, barracuda and turtles. "Cabbage Patch" is home to one of the biggest cabbage coral patches a diver is ever likely to see. Reef sharks, hump head wrasse and colourful schools of reef fish are commonly seen on this relaxing dive. The passage is a marine reserve. Home to "Golden Chimney" and "Coral Wonderland". The Golden Chimney is a large coral structure completely covered in golden soft corals, which when blooming light up the entire area. Gorgonian fans, moray eels, reef sharks, garden eels are other highlights of this dive. Coral Wonderland combines the best of wall, drift and relaxed coral watching. The dive starts deep with some very large fan corals on the edge of a very deep drop off. At the end of the wall, large schools of barracuda often hang out along with a grey reef shark or two. The last part of the dive is spent in shallower coral gardens which go on and on with reef fish schooling in large numbers. A very special dive and one of the few places in the world where manta rays can be seen regularly. You'll be taken by the size and graze of these beautiful creatures as they circle inquisitively. Though almost within touching distance all you'll do is stand back in awe. Even without these magnificent creatures, the reef itself is outstanding in its quality and diversity of fish life. If you see mantas as well, this dive will always rank amongst the best you will ever do. Great Dive Package Specials are also available! Matava Resort is on the South East side of Kadavu Island facing the predominant South Easterly swell. Fortunately, the Great Astrolabe barrier reef lies directly in front of the resort sheltering it from any swell and providing large calm lagoons for water based activities. There are five nearby passageways through the barrier reef and three of these can offer excellent reef break surfing. We run 3 hour boat surf trips on request at a time of day best suited to the tide and prevailing surfing conditions. Intermediate to advanced surfing skills are required.